The liberalization of political and intellectual life in China and the rise of Tibetan exile communities throughout the world have produced a resurgence of spoken and written Tibetan. These developments, together with increasing contacts between Western scholars and Tibetans, have created a widening circle of English-speakers-in government, business, academia, and elsewhere-who need to speak or write Tibetan with precision and clarity. For these people, and for others who want to communicate with Tibetans in their own language, Professor Goldstein's Dictionary will be an indispensable aid. The first scholarly English-Tibetan dictionary, as well as the only one that is semantically sensitive, this work specifies the Tibetan terms that correspond to the submeanings of a single English term. Containing roughly 16,000 main entries, most of which have multiple subentries, the Dictionary treats a total of 45,000 lexical items. 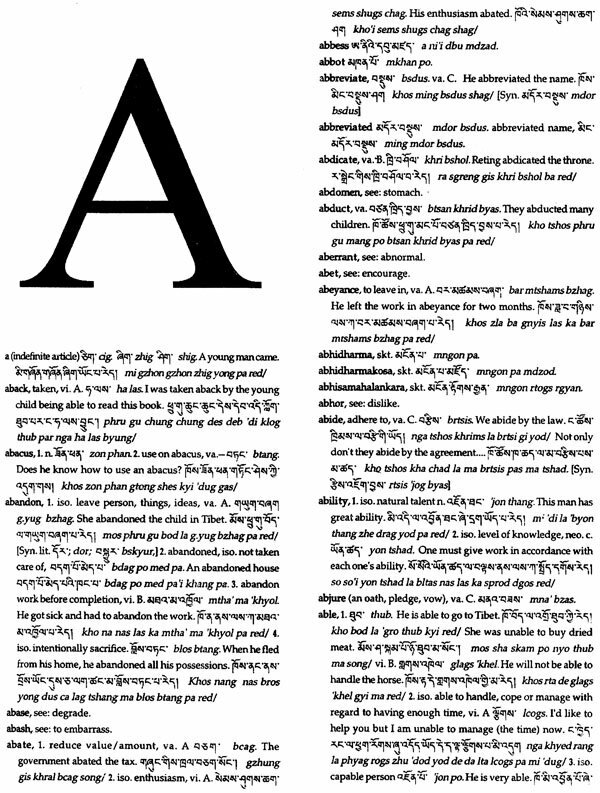 Each entry includes the written Tibetan orthography. Grammatical features are also noted, and all examples of usage are presented with both the Tibetan orthography and the romanization of the written Tibetan. An introductory essay familiarizes users with the main features of Tibetan grammar. Melvyn C. Goldstein, Professor of Anthropology at Case Western Reserve University, is the author of the Tibetan- English Dictionary, Modern Spoken Tibetan, and Modern Literary Tibetan. He has conducted research with the Tibetan- speaking populations of India and Nepal in settings that range from a Tibetan refugee settlement in India to the most remote part of Nepal, where he studied an indigenous seminomadic group nestled on the Ti-betan border. Recognized as one of the world's leading experts on Tibet, Goldstein has over thirty published essays concerning Tibet. This dictionary was compiled during a thirty-month period beginning in the summer of 1980 under the sponsorship of the National Endowment for the Humanities (RT-*1374-80) and the Institute for International Studies, U.S. Department of Education (G008001738). 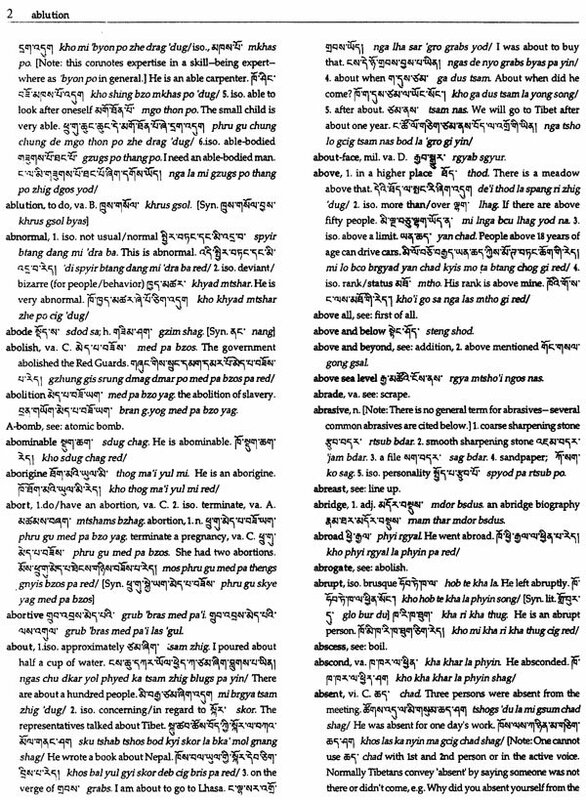 My aim in compiling this English-to-Tibetan dictionary was to produce for the first time a Tibetan dictionary that was semantically sensitive, that is, able to bridge the semantic gap between English and Tibetan so that English speakers could express themselves effectively in Tibetan. Let me illustrate the type of semantic incongruity this dictionary tries to overcome. Where English uses one term, "blow," for three types of action- (1) the blowing out of a flame (e.g., a candle), (2) the blowing of the wind, and (3) blowing air (e.g., into a balloon)- Tibetan utilizes three different terms. Earlier dictionaries and glossaries at best simply listed various Tibetan terms that represented submeanings in English without indicating which of the English submeanings they conveyed. The user had no way of knowing whether he was selecting the term for "the blowing of the wind" when he was trying to express "the blowing up of a balloon." The present dictionary was compiled precisely to overcome such discontinuities between Tibetan and English. Thus, it is concerned primarily with spoken communication and is meant to provide English speakers with the spoken Tibetan equivalents of English terms in a semantically sensitive framework. To produce a dictionary of this type, previous works could not be used as prime building blocks, and Mr. Ngawangthondup Narkyid, a noted Tibetan scholar, and I accordingly started from scratch. We began with the unabridged Random House Dictionary of the English Language (1967) and went through the entries from A to Z, debating and arguing, not only on spoken usage in Tibetan, but often on current usage in American English. My colleagues at Case Western Reserve University and Tibetan friends throughout the U.S.A. and abroad were often drawn into these discussions, and their patience and advice were greatly appreciated. Since I assume that this dictionary will be used primarily by teachers, students, and scholars, we have included not only "basic" English lexical items such as "house" and "blow" but also terms that might be useful in research or scholarly communication. On the other hand, it seemed pointless to include obscure words such as "prolegomenon," "proleg," or "proline," since these either have more standard English equivalents or fall within the realm of highly technical subspecialties such as organic chemistry and would be meaningless to all but a handful of Tibetans who would probably already know the English term. It is important to note that in no instances did we simply translate definitions of English terms into Tibetan. While such translation-definitions might be useful for Tibetans learning English, they do not assist native English speakers studying Tibetan. Instead, we tried to select Tibetan terms and phrases that could be used equivalently in spoken Tibetan. For example, we did not define "ketchup" as "a type of sauce for food," since this would be of no help to English speakers communicating in Tibetan. Finally, although we consulted older Tibetan dictionaries, including a realphabetized version of my own, large Tibetan-English Dictionary of Modern Tibetan (Bibliotheca Himalayica, Series II, Vol. 7., Ratna Pustak Bhandar, Kathmandu, 1975), in the end our decisions regarding equivalent terms were based on our own knowledge of modern Tibetan. It is worth reiterating that our guiding principle was simple: what would the user have to know to convey English terms in Tibetan. Thus, whenever there was an option between a spoken and a more literary term, the spoken term was always selected. 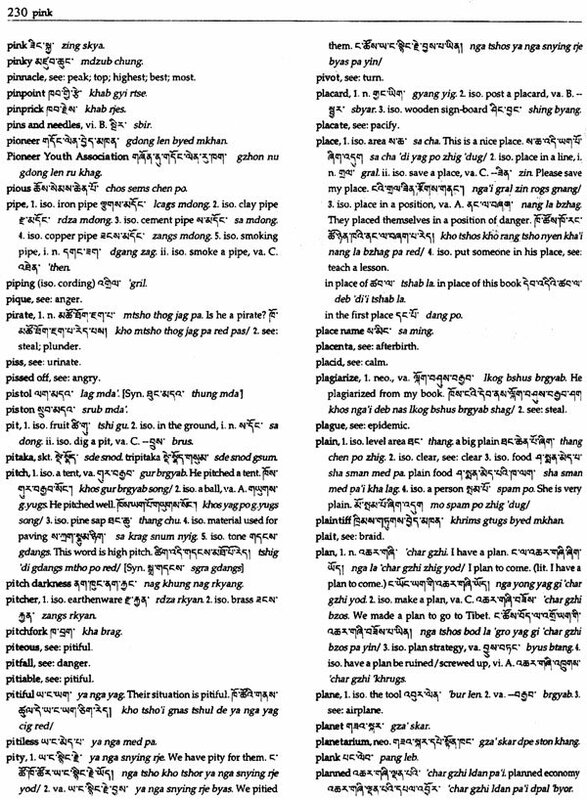 This spoken orientation of the dictionary, however, does not preclude its usefulness in communicating in modern written Tibetan, since the written language is based to a large extent on the spoken. In fact, we see assisting Westerners to write and spell correctly in Tibetan as one of the important functions of the dictionary. 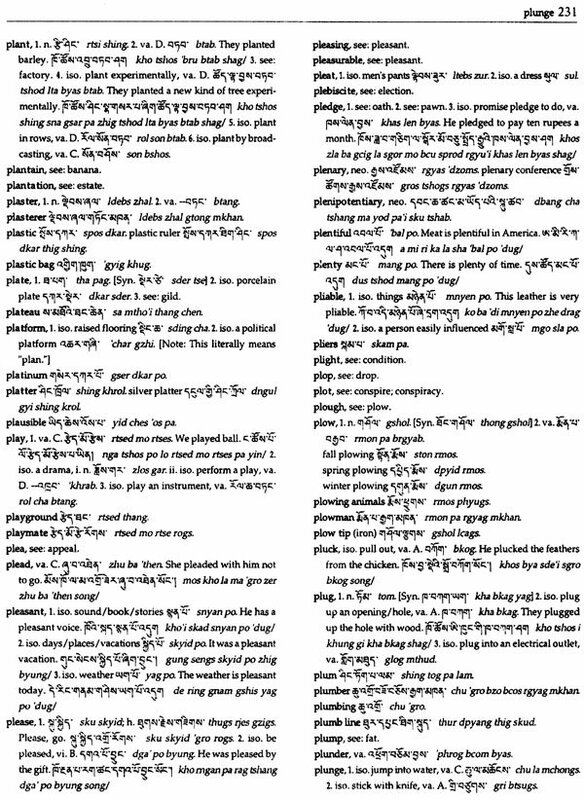 Two techniques have been employed to convey the relationship between the Tibetan and English semantic universes. The first consists of indicating which submeaning of English terms is intended by means of very brief paraphrases introduced usually by iso. (in the sense of). The second technique is to provide a sentence or clause to illustrate the usage of that submeaning. For example, for the term "blunt" we distinguish two submeanings: (1) iso. not sharp and (2) iso. frank. With each of these submeanings we provide an illustrative sentence. For (1) the example is "This knife is blunt," and for (2) it is "He is very blunt." There are, of course, other submeanings of "blunt," but we felt that these were the two most useful and common meanings. Clearly, then, the present dictionary does not attempt to list comprehensively all submeanings of English terms, but rather presents only what we consider the more important submeanings. Illustrative examples are also often used to demonstrate the most common form of syntactic construction used for that entry. In many cases common English terms simply could not be meaningfully translated into Tibetan and were omitted. We have also tried to avoid including newly invented Tibetan terms that are used only by a small group of intellectuals. In general, we preferred to take less precise, "common" phraseologies that would be universally understood in context rather than arcane, newly invented terms. When we have included more specialized new terms, we assume either that they are widely used, that they are self-explanatory from the constituent morphemes, or that they will be used only by specialists in that field (e.g., physicians for medical terms). Finally, it is important to note that there are really two speech communities of Lhasa Tibetan. One consists of the Tibetans now residing in exile in such countries as India, Nepal, England; the other, of the Tibetans residing in Tibet. While these two groups have absolutely no difficulty in communicating, divergences with regard to new vocabulary have occurred since their initial separation in 1959. Although it is not unlikely that the two speech communities will continue to diverge in the years ahead-with the "exile" Tibetans continuing to use substantial numbers or English and Hindi phonological borrowings as well as newly coined terms and Lhasa Tibetans using Chinese phonological borrowings and other newly coined terms (which are indicated in the dictionary by "c")-with only a few exceptions the terms used in the present dictionary will be understood by Tibetans both in Tibet and in exile.